Well, there you have it.... my 24th marathon is in the books and what a great day it was for the 36th running of the Marine Corps Marathon. It certainly wasn't the warmest during the pre-dawn hours, but I didn't mind. Compared to what the weather was like the day before (cloudy, rainy, and even some snow flakes! ), this was perfect. As the sun began to rise, I was treated to an amazing array of colors. Being a local of DC, it was a great feeling to toe the line at my home race. Many parts of the course are routes I use for my training runs, which was nice. For the non-locals, you got to experience a truly unique course.... Rosslyn/Georgetown/Watergate/Kennedy Center/Lincoln Memorial/Jefferson Memorial/Hains Point/Tidal Basin/MLK Memorial/Monument/Capital/Crystal City/Pentagon/Iwo Jima Memorial. What's not to like? My goal for the race was to beat my current marathon PR (3:54:20). I had run a strong half marathon (1:39:47) in early October, so I knew the possibility of setting a new marathon PR was real. However, no matter how well prepared I am on race day, I still get butterflies before the start. For me, there's always a level of uncertainty before the race starts. I've run enough marathons to know that even if I'm well prepared, things don't always go my way on race day. I found my way to the start corral and patiently waited for the race to start. Before any race starts, I ask my Dad to watch over me and provide me the strength I need to finish the race. Running has given me the ability to connect with him in such a special way. Never do I feel his presence more then when I'm running. 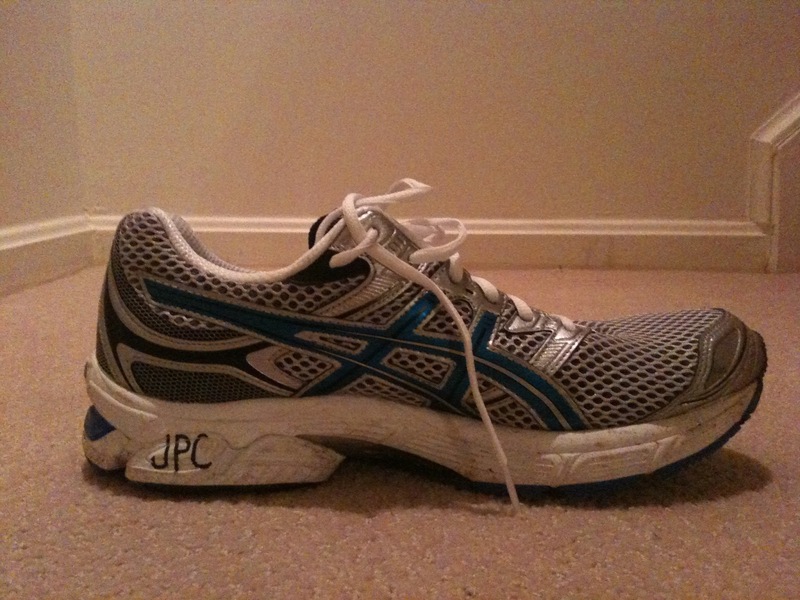 I always write his initials on my running shoes to remind me that he's always with me. 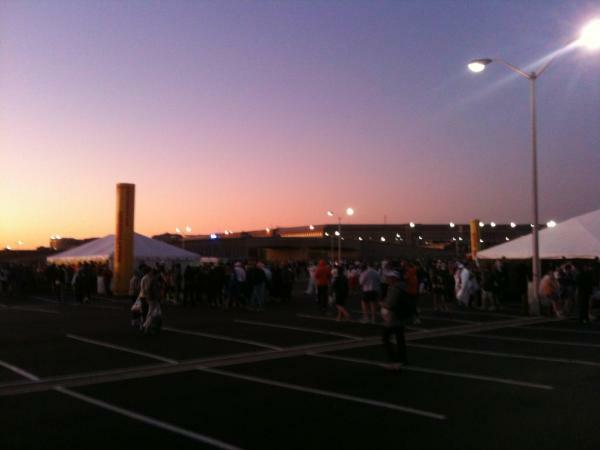 It had been awhile since I'd run in a marathon of this size (there were about 21,000 finishers). I forgot how annoying it is to not be able to maintain a consistent pace when I'm surrounded by runners on every side. Instead of zigging and zagging between runners, I patiently waited for gaps to develop in front of me. The atmosphere on the course was awesome! The run down M Street in Georgetown was electric and I was surprised at the amount of spectators that were out when I reached the Lincoln Memorial. It took me a lot longer than expected to find my rhythm in the race. It wasn't until the 11th mile that I started to get comfortable and felt ready to up my pace. I treat the first half of a marathon as a warmup. I like to run at a relatively conservative pace to ensure I have enough in the tank for the second half. For me, the real race starts after the halfway point. That's when I kick it into the next gear and start pushing myself to the limit. I'm all about the negative split, or running the second half of the race faster than the first half. Most runners claim they have a more positive experience running by this method because it leaves them feeling stronger at the end of the race. The second half of the race took me past some of my favorite places in DC. After running through the Tidal Basin around mile 16, the course route went right by the newly built MLK Memorial. Next, the course took you through the National Mall for miles 17 through 20. Overall, I was feeling pretty good. I was able to increase my pace by about 15 to 20 seconds per mile since passing the halfway point. However, my quads were starting to tighten up and my legs were getting heavy. I tried to ignore my legs as best as I could and continued pushing. I was able to maintain my pace through the Crystal City out and back section, but once I made it to mile 24, fatigue was setting in big time. The last two miles were really difficult. Checking my watch, I saw that I was close to finishing under the 3:50 mark. Knowing that was all the motivation I need to keep pushing! When the finish line came into view, I was flooded with relief. The end was near and I was going to make it under 3:50! As I crossed the finish line, I pointed my fingers skyward and thanked my Dad for being with me out there. Waiting in line to receive my finishers medal, I began to reflect on my race. I started to feel tears well up in my eyes. Running a marathon brings so many different emotions to the surface. 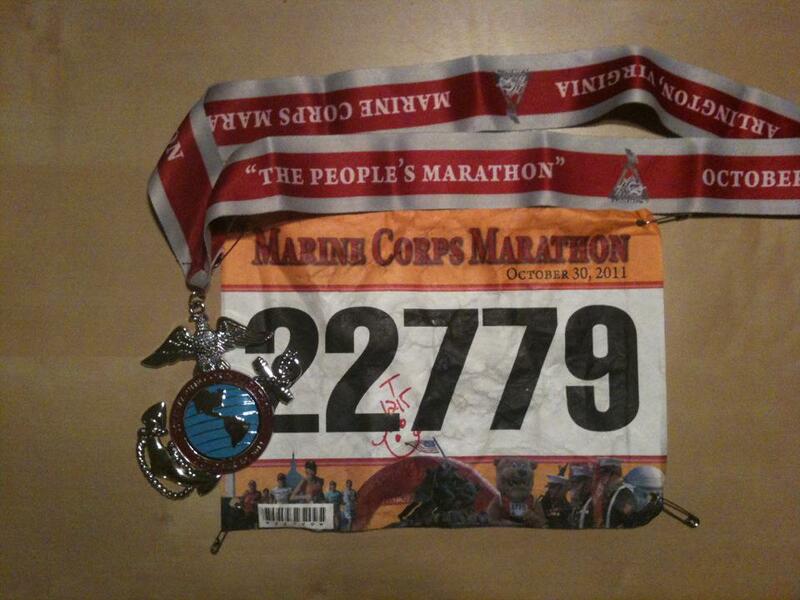 I kept myself composed as a Marine placed my finishers medal around my neck and congratulated me. I thanked him for his service and then found a quiet place off to the side to be alone for minute. 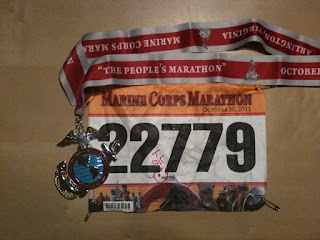 The realization of running my best marathon was starting to set in. I started thinking about my Dad again. I thought about how much I miss him, but at the same, how grateful I was for having him out there with me in my heart and soul. I could not hold back the tears any longer. They say that running a marathon changes your life forever. I couldn't agree more. It's such a wonderful distance to test the limits of human endurance. As the late Emil Zatopek once said, "If you want to win something, run a 100 meters. If you want to experience something, run a marathon." HUGE congrats on your PR out there! Especially on that crowded course. Glad your day was a good one and you ran well.